After slumping from the July 24 high of 84.10, the U.S. Dollar Index (DXY) appears to be in position to make a new move higher. Oversold conditions on weekly charts combined with a successful test and rebound off former downside resistance (now support) at 78.50 raises the likelihood of a solid move to the upside, and a possible test of key trend line resistance near 86.30. Helping the dollar recently has been: a better-than-expected 2.0% rise in Q3 GDP; a 5.7% rise in new homes sales (as well as an 11.7% rise in the median price of a new home); a climb in the Michigan Consumer Sentiment Index to 82.6 (its higher reading since September 2007); a 5-year high in German Consumer Confidence; and a decline in energy prices, particularly a 2-week 24-cent decline in the national average price of gasoline (from $3.82 to $3.58). All of these factors suggest that the economic climate in the U.S.continues to improve. Worries of possible regime changes in China, Japan and North Korea could give the greenback a boost over the short-run as well. Slow moving structural reforms in Europe might also blunt the recent rise in the Euro verse the dollar in coming weeks. Still, it will likely be the post U.S. Presidential election period that determines how quickly Congress will tackle issues that impact the “fiscal cliff”. That being said, even if the “fiscal cliff” was to be addressed with bi-partisan sponsorship, any gain that the DXY might make, could on the margin crimp corporate profits. In turn, that could put downward pressure on equity prices over the intermediate-term and flatten the yield curve if investors decide to shift to longer dated maturities. Nevertheless, addressing the “fiscal cliff” in a workable and tactful way will help equity prices over the longer-term and held stimulate steady economic growth as well. It’s just the next few months of possible rancor, acrimony and (in the end) agreement that could be troubling for investors, employers and taxpayers at large. 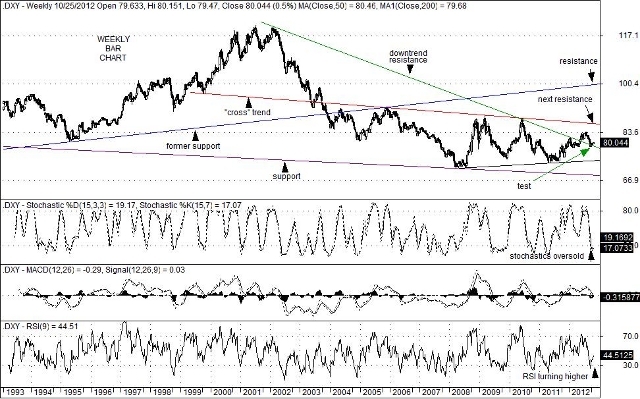 This entry was posted on Wednesday, October 31st, 2012 at 9:00 am	and is filed under U.S. Dollar Index (DXY). You can follow any responses to this entry through the RSS 2.0 feed. You can leave a response, or trackback from your own site.